First of all you do not have to be referred for treatment by a doctor. You can either call in to visit us and book an appointment or you can call in by phone. Consultations are scheduled at 30 to 45 minutes, but infrequently can take over an hour, so if you are attending for the first time make sure you put in enough money to cover that period in the parking pay and display meter. If you are nervous or think you will feel ill at ease, then please bring a family member or close friend for moral support. We try to make you feel as relaxed as possible. We know that some people feel rather self-conscious and vulnerable during the physical examination particularly relating to certain conditions, so please ask to be assessed or treated by someone of your own gender if that would make you feel more comfortable. However, you cannot receive treatment without first having an assessment and evaluation of your condition or injury (the Consultation). Even if you have seen another therapist or consultant previously, we are �professionally obliged� to re-evaluate your condition. This is to make sure that nothing has been missed or over-looked in your previous treatment/evaluation, and is for your safeguard and to give us a measure of your current condition. Sometimes you can benefit from another perspective of an injury or condition. » how your injury or condition first appeared? » how it has progressed? » what treatment you have had and how it responded? » what investigations have been done? » how it is at the present? » what it stops you doing and what you can still do with it? We seem to ask lots of questions, some of them may not seem important or relevant to you, but they may play a vital role in excluding something, and in this way can help us to pinpoint more precisely not only what your problem is, but also the likely cause! By the time we have completed this part of the assessment we should already have a clear idea of what the problem is, and so the physical examination then helps to confirm this by undertaking specialised tests, measurements and manoeuvres to bring us to a final diagnosis. Sometimes an option of two or more diagnoses exists and you may require further investigation with x-rays or a specialist referral for an MR scan or other investigative procedure. Once we have a diagnosis, we will explain the condition and the likely causes, and the likely course of recovery with, if possible, a general idea of how long it will take. It may be possible to split the recovery period into stages reflecting either reduction in pain or, return to function, sport or work. We know that you won't retain all that we tell you on you first visit, so don't hesitate in asking us again. The more you understand about your condition or injury the smoother and faster your recovery. We usually have time to commence some form of treatment, though this may be an abridged version of a full treatment session. The over-riding need is to leave you with a clear strategy for your recovery. You will be advised on both treatment and a programme of rehabilitation exercises to undertake at home, and clear guidelines as to what it is reasonable for you to be able to do and what to avoid doing so as not to interfere with and slow down the recovery process. None of the exercise programmes we use should make your pain or condition feel worse. If they do, we ask you to stop immediately and contact us. The chances are that either we have given you an inappropriate exercise for your stage of recovery, or that you have corrupted the exercise we have taught you, so please stop. Sometimes, with your agreement, we feel the need to refer you on to see a specialist or for investigations such as x-rays or MR scan, or make recommendations to your doctor for stronger pain relief, anti-inflammatory medication or pain modulating drugs. We write a concise but comprehensive letter to your doctor summarising your complaint or injury, diagnosis and proposed treatment. Some patients do not want their doctor to know they have sought physiotherapy treatment, or to have their injury or complaint detailed on their medical records. We will respect their wishes in this regard but emphasise that if a referral to a specialist is needed, the doctor will have to prepare a referral letter and may question why he has not been notified at the outset. These are scheduled to last 30 minutes. We don't as a rule do any treatment that you could be doing yourself at home, except to show you what or how to do it, or to check that you are doing it correctly. Normally the session starts with a quick appraisal of how you are progressing, how much better or if there has been a deterioration for any reason. There may be a specific re-evaluation of certain physical tests to see whether reported improvements or deterioration is in line with measurable clinical findings. This helps us to modify your treatment protocol to ensure that your recovery is taking place at the optimum pace. The treatment or exercise programmes shouldn't be too aggressive or too gentle so as to be ineffective. Wherever possible any exercises that are prescribed will be given to you on exercise sheets to take home as will any advice to do with use of heat/cold or the use of pain relief or anti-inflammatory medication. If you are a new patient to Sport-Med or have never had physiotherapy treatment before, then you may feel a bit nervous about attending for physiotherapy treatment for the first time. We hope this information will give you the confidence that your will be well looked after and we will do all we can to help you to feel relaxed and at put you at ease. We know that being in pain or being frustrated by a niggling injury makes people up-tight and anxious. Some patients are worried that treatment is going to hurt them and cause more pain and suffering. Well that is not the way we deliver treatments at Sport-Med. We are acutely aware of how important it is to limit the amount of pain and discomfort you are experiencing. Not just so that you feel better, but so that we know we are working to off load stress or strain from pain sensitive structures in the affected area. You will be greeted in our reception area and asked to fill out a registration/consent form. Before the consultation commences you will be required to sign the consent form to agree to receiving the assessment, evaluation and treatment, and to agree to pay in full for professional services rendered. On the reverse side of this form is a medical check list that helps us to make sure that we do not overlook any relevant medical details that don't always come to light in the assessment and which may have implications to the diagnosis or treatment. It would help if you have the Doctor's name and Surgery name and address (telephone no. if possible). If you have already seen a medical professional previously and have records, reports, x-rays or MR scans and their reports, then please bring them if they are relevant to your condition or injury. You can either get these done on the NHS or have them done privately. If you go to your doctor (we'll usually send a covering letter in the post) you can request an appointment for an x-ray at your local hospital. This can take a few days, and you'll generally wait ten days before you get any results. You'll only get a report and you won't have the x-rays to look at. If you have x-rays done privately we can often arrange to have these done on the same day at a local radiographers. We complete a request form on your behalf. The x-rays are taken and left for reporting by the radiologist. We often receive the report the same day by fax and the x-rays arrive in the post the following day for us to view and for you to take away with you if you want. Joints like knee, ankle and wrist cost about �90 -110 whilst backs and necks can be nearly �140, but you do tend to get a more comprehensive report and you actually get to see the x-rays yourself, which are far more enlightening than the report itself..
What if I need an MR Scan? If this is a scan of an extremity such as an ankle, knee, elbow or wrist then this can be done on a small scanner in the North West (Preston) without the need for referral by a specialist. It costs in the region of �190.00 and then you have to pay for the MR scan to be reported on, and this may cost about �80.00 The quality of the scan is very good indeed, and is comparable to some of the larger scanners in hospitals. 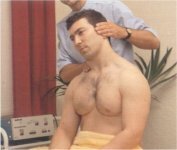 If you need a scan of your back or neck to check for prolapsed disc or nerve root compression, then this has to be done on the larger type of scanner. For this you will first of all need to be referred to a specialist, as a physiotherapist cannot make a referral. Recently your doctor can now make an MR scan request so that a more informed decision can be made as to whether a specialist referral is in fact necessary. In these circumstances we would send a covering letter to your doctor requesting referral to see a specialist and why we think you might benefit from a scan. We would also send a detailed letter to the specialist outlining our examination findings and why we think you might require further investigation. Scans can be done on the NHS but this is entirely at the judgement of the NHS specialist. Often the waiting list can be some weeks. Some people elect to have a scan done privately rather than wait and this is available within 24 hours, 48 hours at a premium. Usually a scan within ten days is average time to wait, but it may cost you �350 to �550.00. For those patients with cover on a medical insurance plan, you should check that you are covered before proceeding with the scan, but most policies cover this investigation. However, you will often need the specialist referral for an MR scan if you are to claim off your medical insurance programme. First of all we will consult you and discuss the reasons and benefits from seeking a specialist opinion. It might be for further investigation (MR scan) or to see if the specialist thinks you are a suitable candidate for surgery. We will write a progress letter to your doctor outlining the reasons we think you need the referral either on the NHS or as a Private Patient. In the NHS route we may recommend that you are referred to a particular Specialists clinic, but you may not necessarily see that Specialist. You may see one of his Registrars or a very highly trained physiotherapist. You will still get excellent care and the appropriate investigations, but you may have to wait a few weeks for the appointment unless your doctor has a method of fast-tracking you as a very urgent case! If the specialist thinks you need surgery, often you will be placed on a waiting list according to the severity and urgency of your condition. This can vary from anything between a week to many months. You can sometimes cut out some of the waiting time by seeing the specialist privately in the first instance, to get his opinion on whether you need surgery. This may cost in the region of �120 to �250 depending on whether you see an orthopaedic surgeon or a Neurosurgeon. You must make it known to him that you want to be transferred to his NHS clinic, but often you still have to wait the same amount of time, you just know whether you need surgery, or should continue with rehabilitation, sooner. The approximate costs of various common operations are given below as an indication, should any uninsured person want to consider paying for surgery themselves. What if I need blood tests? In this situation blood tests can usually be done at your doctors surgery and there is little benefit going privately. We commonly refer patients back to their doctors for blood tests if we suspect Gout, Diabetes or a Rheumatoid condition. Often the appropriate treatment is medication and you will need to see your doctor for this anyway. What if I need orthotics (corrective insoles)? We have our in house Podiatrist with whom we can arrange an appointment. If you are under 16 years and over 65 years old or have a disability you can attend the Stepping Hill Podiatry Clinic or one of the satellite clinics at a local Doctors Surgery. This is an NHS service and won't cost you anything, but be prepared to wait a little while for your orthotics, and be aware that economy can be a major factor in their prescription! We can give you a contact number for this service if you require it. If you can give us your medical insurance details, including registration number and / or authorisation number, we can often receive settlement of your account directly from the insurance company. You may need to complete a claim for and often this will need to be authorised by your doctor or a specialist. A few insurance companies such as BUPA do accept claim forms signed by the Chartered Physiotherapist. Please check that you are covered by your policy by giving the insurance company or their agents a ring. It is useful to know whether there is a limit on physiotherapy or out-patient cover and how much this is. You will expect to cover any shortfall due to non-payment by the insurance company as a result of a policy excess or limit on funds. Some policies require that after six or eight sessions you must either return to your doctor for re-authorisation, or get a referral to a specialist to progress with further investigation or to recommend continuing with physiotherapy treatment. There may be an 'excess' on the policy, which will fall to you to settle directly with us before your treatment is concluded. Strapping and supports are not covered under the terms of many policies and you may be required to pay for these separately. We can provide a list of all the medical insurance companies we deal with, the numbers of each Hotline and our Provider number for each company, to assist in the smooth running of your account. If your insurance company is not listed here it is probably a sister company or an agency for a larger company. Please let us have your details and we will contact them to set up your account.